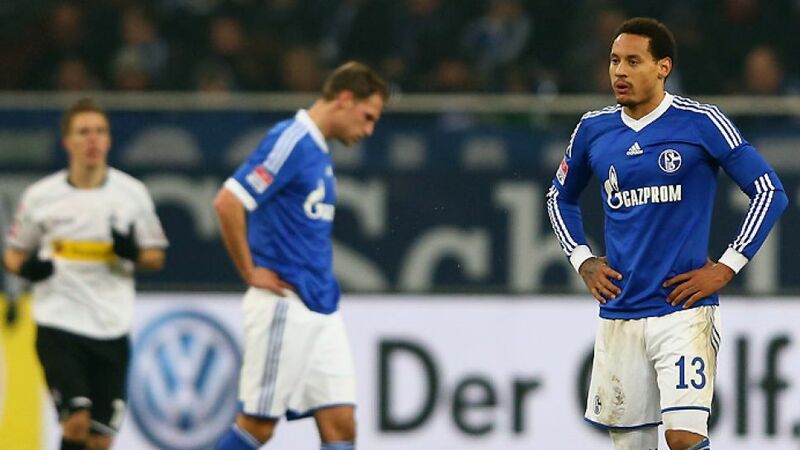 Jones: "Boost to our morale"
Gelsenkirchen - Schalke 04 have certainly seen enjoyed better days. Saturday's draw against Borussia Mönchengladbach now leaves them without a win in four matches, a run that has has seen them fall off the pace at the top of the league table. Domestically, the Royal Blues are in something of a rut, no question. In spite of that however, United States midfielder Jermaine Jones was in good spirits after the game, focusing on the strength of character that the team showed to come back against a stubborn Gladbach team, something he believes will help the team no end this season. bundesliga.com: Jermaine Jones, how do you assess the 1-1 draw against Mönchengladbach? Jermaine Jones: I think we were the far better side over 90 minutes. Gladbach scored with their first attempt on goal, but we showed we have a good spirit to come back yet again. We carried on attacking them and that says a lot about this team. bundesliga.com: You could have scored on a couple of occasions yourself. Jones: I should have done better from Christian Fuchs' fantastic cross from the left when I headed straight at the goalkeeper, and that wasn't the only chance I had. If you're on a run and things are going for you, the ball might drop in, but they just aren't for us right now. bundesliga.com: You seemed to have a lot of difficult in the game when Borussia went 1-0 up. Jones: Gladbach defended really deep the beginning, and they were even more compact at the back once they had scored. There wasn't much space for us to work with. But we never gave up and just kept attacking, and at we got some reward with a draw and a point. bundesliga.com: Head coach Huub Stevens spoke of 'clearing the players' minds' after last week's defeat at Hamburger SV. Was that successful? Jones: I think we definitely we went into the game with clear heads. We were in total control and dominated the game, and that was a good way to respond to the Hamburg match. bundesliga.com: Is this a performance you can build on? Jones: I think so. We didn't play well in Hamburg, but here we were competitive and kept Gladbach in their own half throughout the game, on a bad pitch as well. We didn't win the game unfortunately, but it's a boost to our morale to get a draw after a being a goal down. bundesliga.com: What can the club achieve this season? Jones: It's important for us to be playing in Europe again next season. We have two more games this year and the complete second half of the campaign to achieve that goal. bundesliga.com: You've already qualified for the last 16 of the UEFA Champions League with a game to spare and about to face Montpellier SC on Tuesday, are fourth in the Bundesliga and still in the DFB Cup. Everything seems to be going according to plan. Jones: That's right. Things have gone really well in the Champions League, and we'll be trying everything to finish top of our group on Tuesday, but going about it in a relaxed way. Then all we need to do is to get back to winning ways in the Bundesliga against Stuttgart next week. bundesliga.com: Is there a particular team you would like to meet in the Champions League's knock-out stages? Jones: There are lots of great sides in the competition. I wouldn't mind avoiding Barcelona, Real Madrid and Manchester United at this stage, but you just have to take it as it comes.